Using Microsoft Frontpage to add an email form to your website can be accomplished quickly and without too much work. The steps for doing this are outlined below. First off, please spend a few moments to generate your form HTML code. 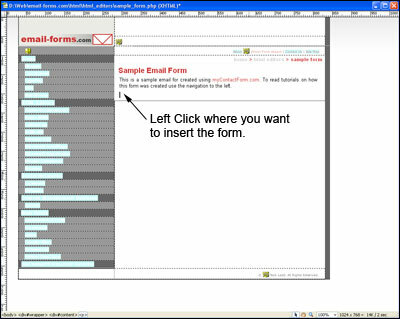 myContactForm.com (a free email form service) can be used to do this quickly and is outlined in the tutorial, here. Start Microsoft Frontpage as you would normally do. b. Paste the form HTML into the code. 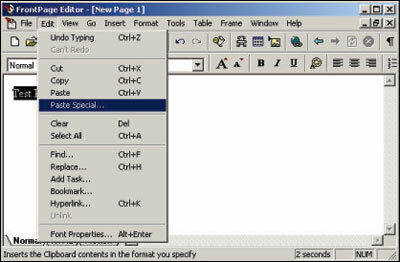 In Frontpage you must do this by selecting Edit > Page Special. c. A new Paste Special window will open. 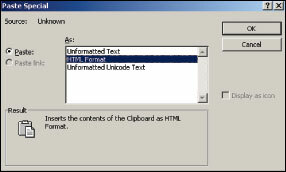 Select HTML Format and then click OK.
Upload the file containing your form to your web server. This procedure will vary depending on whether you are using an external FTP client or Frontpage's built-in client. Open a web browser and go to the web page containing your form. Fill out the form and press the submit button to send a test submission through. We've created a sample email form created using Microsoft Frontpage which can be seen here.